Diffuse nitrate pollution in groundwater is currently considered one of the major causes of water quality degradation. Determining the sources of nitrate contamination is an important first step for a better management of water quality. Thus, the isotopic composition of nitrate (δ15NNO3 and δ18ONO3) and boron (δ11B) were used to evaluate nitrate contamination sources and to identify geochemical processes occurring in the shallow and deep aquifers of the Turin-Cuneo plain (NW Italy). The study area is essentially an agricultural zone, where use of synthetic nitrogenous fertilizers and organic manure is a common practice and the connection to sewer services is locally lacking. Also livestock farming are highly developed. A groundwater sampling campaign was performed on 34 wells in the shallow aquifer and 8 wells in the deep aquifers, to analyze nitrate, chloride, boron, δ15NNO3, δ18ONO3 and δ11B. Isotope data of nitrate indicate that nitrate contamination in the Turin-Cuneo plain originates from mixtures of synthetic and organic sources, slightly affected by denitrification, and manure or septic tank effluents. Moreover, boron isotopes were used to discriminate further among the main anthropogenic sources of pollution. The analyses results confirm that both animal manure and domestic sewage, especially under the city of Turin, can contribute to the nitrate contamination. The isotope analysis was also used for the evaluation of denitrification and nitrification processes: contrary to expectations, a significant denitrification phenomenon was assessed only in the shallow unconfined aquifer, especially in the Poirino Plateau, the most contaminated sector of the study area. Nitrate pollution in groundwater is currently one of the major cause of water quality degradation. Starting from the second half of the past century, the global increase in the use of N-fertilizers (synthetic and organic) has led to increased nitrate leaching and runoff. Consequently, large regions of the world suffered from nitrate contamination of surface and groundwater, especially in agricultural areas. The correlation between agriculture and nitrate concentrations in groundwater was observed in many studies coming from different countries (Agrawal et al. 1999; Nolan and Stoner 2000; Harter et al. 2002; Debernardi et al. 2008; Capri et al. 2009; Petitta et al. 2009; Sacchi et al. 2013). The extensive use of fertilizers for agricultural purposes, in fact, is considered to be the main non-point source of nitrate contamination in groundwater (Liao et al. 2012; Postma et al. 1991; Baker 1992; Chowdary et al. 2005). However, nitrate pollution in groundwater can also be caused by other sources, such as septic systems (Al-Agha 1999; MacQuarrie et al. 2001). The Nitrates Directive (European Commission 1991) is one of the earliest pieces of EU legislation aimed to protect water quality across Europe by preventing nitrates from agricultural sources polluting ground and surface waters and by promoting the use of good farming practices. One of the adopted action was the Designation of “Nitrate Vulnerable Zones” (NVZs). NVZs are territories which drain into polluted waters or waters at risk of pollution and which contribute to nitrate pollution. As regards water resources, groundwater containing or that could contain (if no action is taken to reverse the trend) more than 50 mg/L of nitrates are defined as polluted water, or at risk of pollution. In Piedmont, that represents the westernmost region in Italy, NVZs correspond to the 37.6% on utilized agricultural area and 54% on regional plain areas (Ministry for Environment et al. 2010). In the NVZs action programs must be implemented by farmers on a compulsory basis, including limitation of fertilizer application (mineral and organic) and other measures at farm scale. The application of these measures can have negative impact on farm economics, especially for small farms (ADAS 2011). Consequently, the definition of the different nitrate sources in groundwater (sewage, animal manure, chemical fertilizer, natural soil mineralization) has major importance, especially for the stakeholders that must implement management actions for groundwater protection. To define the sources of nitrates in groundwater, the stable nitrogen (δ15NNO3) and oxygen (δ18ONO3) isotope of nitrates have been extensively used (Aravena et al. 1993; Seiler 2005; Sacchi et al. 2007; Re and Sacchi 2017). Nitrates from mineral fertilizers are characterized by the atmospheric values of δ15NNO3 (approximately 0‰) and δ18ONO3 (approximately 23.5‰), whereas nitrates derived from organic fertilizers, livestock effluents and sewage are usually enriched in 15N (δ15NNO3 varies from +8 to +20‰) because of ammonium volatilization (Kendall 1998). The correlation between the δ15NNO3 and δ18ONO3 isotopic indicators can also provide data on the nitrification and denitrification in an area. Aravena and Robertson (1998) demonstrated a concurrent increase in the δ15NNO3 and δ18ONO3 of groundwater nitrates during denitrification. During nitrification, the δ18ONO3 ratio changes to lower values because of the incorporation or the exchange with δ18OH2O of groundwater. The typical range of δ18ONO3 for nitrified synthetic fertilizers generally is 5‰ to 15‰; it also depends on the groundwater isotopic composition (Sacchi et al. 2013). Furthermore, nitrification process produces a positive correlation between the nitrate concentrations and δ15N of the nitrates (Choi et al. 2003). Thus isotopic composition of nitrate can help to discriminate between synthetic fertilizers, mineralized synthetic fertilizers, manure/septic system effluents and soil organic matter as nitrate sources in groundwater. However, the use of these isotopes is not useful to further discriminate between manure and septic system effluents that display the same nitrate isotopic composition. In recent studies boron isotopes (δ11B) were used coupled with δ15N of the nitrates to discriminate between synthetic fertilizers, sewage and septic plumes, cattle, poultry and hog manure sources (Widory et al. 2004, 2005; Seiler 2005). Boron (B) has generally a ubiquitous distribution in groundwater, because it commonly exists as a minor constituent (Vengosh 1998). Naturally occurring B is mostly derived from weathering of rocks; thus δ11B composition can be used to identify pollution sources if the contaminants have δ11B values distinct from the δ11B composition in groundwater (Vengosh et al. 1994; Bassett et al. 1995). More specifically, detergents coming from evaporites, synthetic fertilizers, manure and sewage have high content of B and different δ11B signature (Vengosh et al. 1994; Komor 1997; Widory et al. 2005). Komor (1997) and Bassett et al. (1995) first used B isotopes as comigrating tracers of NO3, but only Komor (1997) and Widory et al. (2004) referred the B isotope composition of input from agriculture (e.g., hog manure, cattle feedlot runoff, synthetic fertilizers) and combine N and B isotopes in order to distinguish between different NO3 sources in groundwater and surface water. Microbial processes and groundwater redox that govern N isotope evolution (denitrification/nitrification) have no consequence on B (Bassett et al. 1995). The key factors that affect the B isotopic composition in groundwater are the B sources and adsorption to clays; only in extremely saline environments, mineral precipitation affects the B isotopic composition (Seiler 2005). A recent study (Pennisi et al. 2013) compiled a database of isotopic data on potential boron contaminants of natural waters (ISOBORDAT database). Their isotopic composition, which spans over a wide range, helps to identify boron contamination sources and geochemical processes in water. The purpose of this paper is to define the nitrate contamination sources in the shallow and deep aquifers of Turin-Cuneo plain (NW Italy) using isotopic composition of NO3 (δ15NNO3 and δ18ONO3) and boron (δ11B). Furthermore, the investigation aims to identify the processes affecting nitrate concentrations in groundwater, such as nitrification and/or denitrification. The study area is located in Piedmont (northwestern Italy) and corresponds to the plain between Turin and Cuneo cities (Turin-Cuneo plain). The study area can be further distinguished in different sub-areas: the Po Plain area in Turin Province (Turin plain), a plain area in Cuneo Province (Cuneo Plain) and a plateau area in Turin and Asti Province (Poirino Plateau). The minimum altitude is 200 m above sea level (a.s.l.) in the eastern sector of the plain, corresponding to the confluence of the Stura di Demonte River and Tanaro River, and the maximum altitude is 600 m a.s.l. in the southern sector, near Cuneo town. The plain area is underlain by an important groundwater resource due to its size, the characteristics of sediments and the relatively high rate of recharge in the region (Lasagna et al. 2016a). The study area is featured by superimposed hydrogeological complexes (Fig. 1): the pre-Pliocene complex, the Pliocene marine complex, the Villafranchian transitional complex, the Quaternary deposits complex (Bortolami et al. 1976; Bove et al. 2005). A simplified cross-section was added, to clarify the hydrogeological setting in the alluvial Po plain (Fig. 2). The Turin Hill and the alpine basement border the plain on the west and the east, respectively. The Turin Hill is represented by the Tertiary Piedmont Basin (TPB) deposits, mainly sandy clay, marl, highly consolidated (b in Fig. 1). These sediments have a low permeability, being only locally permeable by fissuration, and do not contain any significant aquifers. The alpine basement mainly consists of crystalline rocks (a in Fig. 1), mostly impermeable or slightly permeable by fissuration, and subordinately by calcareous rocks (a’ in Fig. 1), permeable for karst. The shallow unconfined aquifer is hosted in the Quaternary alluvial deposits complex (Middle Pleistocene-Holocene), consisting of coarse gravel and sand of fluvial or fluvio-glacial origin, with subordinate silty-clayey intercalations (g in Fig. 1). It generally shows a high permeability (k = 5*10−3÷5*10−4 m/s) and represents an important aquifer whose water table is directly connected to surface drainage in the region. Grain size normally decreases from mountains to low plain, in correspondence to the Po River. Its thickness ranges between 20 and 50 m; in spite of the variable thickness of the aquifer, it has a high productivity and has regional importance. The presence of thick and relatively continuous layers of silt or clay-rich deposits generally marked the base of the shallow aquifer (Canavese et al. 2004; Bove et al. 2005). Groundwater temperature values mostly range between 12 and 14 °C in rural areas shallow aquifer (Barbero et al. 2016; Bucci et al. 2017). In the Poirino Plateau, located on the eastern side of the Turin-Cuneo Plain, the Quaternary alluvial deposits complex consists of silt and clay, with rare sandy–gravelly levels (f in Fig. 1); it has a thickness between 10 and 30 m. In this area, the shallow aquifer has small thickness and low productivity. The deep aquifers are located in the Villafranchian transitional complex and in the Pliocene marine complex. The first is a multilayer aquifer, and it consists of alternating clayey silt, sand and small gravel (Middle Pliocene-Lower Pleistocene), thus creating an alteration of permeable and semi-permeable layers (e in Fig. 1). The Pliocene marine complex (Lower-Middle Pliocene) consists of two different units: the Asti sands (d in Fig. 1), permeable and hosting important confined aquifers, and the Lugagnano clay (c in Fig. 1), typically an aquitard with low permeability. In the Turin-Cuneo plain, the shallow aquifer is mainly supplied by rainfall and rivers at the outlet of the valleys on the plain. The general flow direction in the shallow aquifer is SW-NE in the southern part of the plain, and S-N in the northern part (Lasagna et al. 2016a). In the Poirino Plateau, the groundwater generally flows towards the W, i.e., towards the Po River, which represents the main watercourse of the study area. The hydraulic gradient of the shallow aquifer varies, in the northern sector of the Turin-Cuneo plain (Turin Plain), between 3%, e.g., at the edge of the Alps and 0.1% in the low plain. Along the transitional zone from the higher to lower plain, the hydraulic gradient decrease from 0.6% to inferior than 0.3% values; this sector, in which typical lowland springs (fontanili) emerge (De Luca et al. 2009, 2014), is called fontanili line. In the centre of the Turin-Cuneo plain, the hydraulic gradient normally ranges between 0.01% in the central sector and 0.25% near the Alps. On the south of the Cuneo plain, the hydraulic gradient is high near the Alps (0.2%) and decreases to 0.02% towards the central plain. The depth to groundwater in shallow aquifer is very variable: on the low plain and near the rivers, the water table is generally less than 5 m deep, whereas it ranges depths between 20 and 50 m close to the Alps. On the fontanili line, the depth to groundwater varies from 1 to 3 m. On the Poirino Plateau, the groundwater depth is generally low, varying between 0 m and 5 m.
In the villafranchian transitional complex and in the Pliocene marine complex (Asti sand), confined and semiconfined aquifers are generally hosted, with a flow direction generally similar to the shallow aquifer. Only locally, e.g. in the Poirino Plateau, the flow directions are very different (Lasagna et al. 2014). The land use is conditioned by the anthropic activities that in the area are represented by agriculture (mainly cereals and forages cultivations) and farms (especially cows and pigs) (Regione Piemonte 2008). In the small towns domestic waste water is locally not connected to sewerage. Moreover, industrial areas are mainly located in the peripheral areas of Turin while quarrying areas are located near the main streams, especially the Po river, for the extraction of sand and gravel (De Luca et al. 2007; Castagna et al. 2015a, b). As regards irrigation, the Po river basin is very rich of water, which is used for various purposes, including irrigation. A complex network of canals allows water transfer used for irrigation from the Po river and its affluents at the foothills of the Alps downwards, to the productive plains of the Po river basin. The estimated average efficiency of transport and distribution of the network is approximately 69% (Ministry for Environment et al. 2010; Comina et al. 2014; Perotti et al. 2015; Clemente et al. 2015). Irrigation methods are different in the different agricultural area. In Piedmont surface irrigation or furrow irrigation are the prevailing techniques. The land use in the plain can be identified as the cause of a groundwater nitrate contamination, especially for the shallow aquifer (Lasagna et al. 2005, 2013; Debernardi et al. 2008). The designation of nitrates vulnerable zones (NVZs) in Italy falls under the competence of the Regions. The NVZs designation in Piedmont took place in different steps, starting from 2002 and according to the Nitrates Directive (European Commission 1991). The first designation is dated back to 2002 (DPGR 9/R 2002). Designation is based on the criteria of article 3 and Annex 1 of Nitrate Directive, more specifically areas of land which drain into polluted waters or waters at risk of pollution and which contribute to nitrate pollution were designated as NVZs. In Piedmont NVZs comprised both the areas already contaminated, with nitrate concentrations in groundwater equal or higher than 50 mg/L on the basis of the results of monitoring programs in 2000–2001, and conservatively the areas with nitrate concentrations equal or higher than 40 mg/L. The areas identified by the first designation correspond to 220,121 ha and represent about 8% of territory, approximately 30% of the plain. Water Defence Plan (PTA), drawn up by the Piedmont Region in 2004 (DGR 23–13,437 2004) and 2006 (DGR. 28–2845 2006), included in the NVZs also the flood zones A and B of rivers, according to the definition in PAI (Piano stralcio per l’Assetto Idrogeologico del Fiume Po - Po river basin plan for hydrological management) approved by Autorità di bacino del fiume Po (AdBPo 2001). More specifically Zone A is ordinary floods area for a return time up to 50 years and Zone B is flood area for a return period up to 200 years; it corresponds to the area confined by the embankment system. In this way further 54,162 ha of territory were designated as NVZs, in order to prevent any phenomenon of run-off and to contain the transport of pollutants, including nitrogen, towards the surface water body. In 2007 with a regional regulation (DPGR 12/R 2007) were designated additional territories, potentially vulnerable to nitrates from agricultural sources. The vulnerability has been assessed on the basis of a scientific study that took into account some agro-environmental parameters: (a) intrinsic vulnerability of shallow aquifer in Piedmont plain, evaluated by Earth Science Department of Turin University (Bove et al. 2005); (b) protective capacity of the soil, assessed by IPLA (Institute for Wood Plants and Environment); (c) the N-surplus, defined as the algebraic value obtained by the difference between the N-inputs to the soil (organic nitrogen and synthetic N-fertilizers) and the N-output with crop products, evaluated by Agroselviter Department of Turin University (Sacco et al. 2006). In 2007 further 128,094 ha were designated as NVZs. At last in 2013 the delimitation of Zones A and B were updated and consequently new territories were designated as NVZs. Currently in Piedmont NVZs occupy 407,500 ha that represent approximately 38% of the regional utilized agricultural area and about 54% of the plain area (Fig. 3). A groundwater monitoring campaign was performed in October 2014 on 42 water wells and monitoring wells in Turin-Cuneo plain. It includes 34 sampling points in the shallow aquifer (Table 1) and 8 in the deep aquifers. The most of the sampling points in the shallow aquifer are referred to monitoring wells of the Monitoring Network of the Piedmont Region, managed by the Regional Agency for the Protection of the Environment (ARPA Piemonte). These sampling points are located as follows: 17 in Cuneo plain, 11 in Turin plain and 6 in Poirino Plateau. All the sampling points of the deep aquifers are wells, also belonging to the Monitoring Network of the Piedmont Region, mostly used for drinking water purposes: 6 are located in Cuneo plain, 1 in Turin plain and 1 in Poirino Plateau. The groundwater was sampled with a submersible pump, after the purge of the well/monitoring well. The purge time was determined based on the stabilization of water-quality indicator parameters included pH, electrical conductivity (EC), dissolved oxygen concentration and temperature. A Hydrolab Quanta G multiprobe meter was used to analyze the water-quality indicator parameters. The groundwater collection was done using four polyethylene bottles for the different analyses: 0.5 L for nitrate, nitrite and chloride composition analyses; 0.5 L for boron concentration analyses; 0.5 L for boron isotopes analyses; 2 L for nitrate isotopes analyses. After the sampling, the water samples for nitrate isotopes analyses were acidified to pH 3 with concentrated HCl. Groundwater samples were analyzed for EC, nitrate, nitrite, chloride and boron content and isotopic composition of NO3 (δ15NNO3 and δ18ONO3) and boron (δ11B). The EC was measured immediately after sampling in the field with a portable conductivity meter HANNA, with a resolution of 0.1 μS/cm and an accuracy within 1% of the reading. The chemical analyses of nitrate, nitrite and chloride were performed in Earth Sciences Department of Turin University using ion chromatography. Nitrate isotopes were determined by IRMS at ISO4 s.n.c, Italy. Samples were prepared and purified according to the method described by Silva et al. (2000). Uncertainties are ± 0.5‰ for δ15NNO3 and ± 1‰ for δ18ONO3. Boron concentration was determined by ICP-OES (APAT-IRSA 2003) at Nuovi Servizi Ambientali s.r.l., Italy. Boron isotopes (expressed as δ11B‰ vs NBS951) were determined by MC-ICP-MS at ALS Scandinavia AB, Sweden, with an uncertainty of ± 0.4 to ± 1‰. The study area displays different degrees of groundwater nitrate contamination (Table 1). The nitrate distribution map of October 2014 is reported in Fig. 3. In the shallow aquifer the nitrate concentration ranges between 5.3 mg/L and 177.5 mg/L. About 26% of monitored points have nitrate concentration between less than 25 mg/L, 50% between 25 and 50 mg/L, 18% between 50 and 100 mg/L and 6% higher than 100 mg/L up to 177.5 mg/L (Fig. 3). The most polluted areas are located in Poirino Plateau and in Cuneo plain, near Fossano and Racconigi towns. Locally the Turin plain, south to Turin, shows concentration superior than 50 mg/L, near Pinerolo and Carmagnola towns. Near the Po river, the nitrate concentrations are generally low. These results are consistent with previous studies (Lasagna et al. 2005, 2013, 2015, 2016b; Debernardi et al. 2008). In deep aquifers all water samples have nitrate level inferior than 50 mg/L, ranging between 5 and 40 mg/L (Fig. 3). The most polluted shallow groundwater (nitrate concentrations superior than 100 mg/L) is located in NVZs designated in the first phase in 2002 (DPGR 9/R 2002). Actually these areas were selected because already contaminated according to the previous monitoring programs. The sampling points with nitrate levels between 50 and 100 mg/L are generally comprised in the NVZs, with few exceptions. In the study area the nitrate concentration strictly depends on the well/piezometer depth. In Fig. 4 the nitrate levels were correlated with the sampling point depth and a clear relation was highlighted. More specifically, high NO3 concentrations (> 50 mg/L) are always located in superficial wells, with depth inferior than 30 m. In particular, the highest NO3 levels (> 100 mg/L) are present only in wells with depth lower than 20 m; these points are positioned in the Poirino Plateau. As well as at local scale, at regional scale a clear relationship between nitrate concentration and sampling points depth in Piedmont plain was observed by Debernardi et al. (2008) and Lasagna and De Luca (2016). The nitrite concentrations are inferior than detection limit (0.05 mg/L) in almost all samples, except for an agricultural well (020 in Table 1) and a monitoring well (029 in Table 1) of the Cuneo plain shallow aquifer. The EC ranges from 222 μS/cm and 1355 μS/cm in the shallow aquifer, and from 407 μS/cm and 608 μS/cm in the deep aquifer. Chloride varies between 3.7 mg/L and 101.2 mg/L in the shallow aquifer and between 5.7 mg/L and 46.2 mg/L in the deep aquifer. Where sewage is the dominant form of contamination, a close correlation between nitrate and chloride concentrations in groundwater may be observed (Barrett and Howard 2002; Morris et al. 2003). A further cause of nitrate-chloride correlation can be attributed to agricultural activities (Saffigna and Keeney 1977; Kohn et al. 2016), because of the use of synthetic fertilizer, primarily KCl (Kelly et al. 2012). Thus nitrate and chloride were plotted in diagrams of Fig. 4b, showing a moderate correlation between the parameters (R2 = 0.6905, p value = 1.176e-09). However, the correlation analyze is strongly influenced by samples from Poirino Plateau; indeed, performing correlation analyses for the subsets of the data, it was possible to find a low correlation between nitrate and chloride in Turin plain and Cuneo plain, while the correlation in very strong in the Poirino Plateau, with a R2 of 0.9379 (p value = 0.001476). Nitrate and chloride are often used as indicators of contamination in groundwater. However, they have a different behavior in groundwater: while chloride is a conservative tracer, which typically does not undergo biological transformations or sorb to soil, nitrate can be attenuated in groundwater by denitrification processes in the presence of appropriate bacteria and redox conditions (Korom 1992; Rivett et al. 2008). Thus the presence of this process in Turin-Cuneo groundwater could have reduced the degree of correlation between the parameters in bi-plot of Fig. 5b. Also the bi-plot nitrate-EC highlights a moderate degree of correlation (R2 = 0.5091, p value = 2.169e-06) (Fig. 5a). Similarly, to the scatter diagram nitrate-chloride, the correlation analyze between nitrate and EC is strongly influenced by samples from Poirino Plateau; particularly there is no correlation between the sample points in Turin and Cuneo plains, while a strong correlation was obserbed in the Poirino Plateau, with a R2 of 0.8554 (p value = 0.008252). The δ15NNO3 values of Turin-Cuneo plain show high variability, especially in the shallow aquifer (Table 1): the values range between 4.00‰ and 20.66‰ in the shallow aquifer and between 6.05‰ and 9.84‰ in deep aquifers. The δ18ONO3 values range between 4.2‰ and 14.9‰ in the shallow aquifer and between 5.8‰ and 23.6‰ in deep aquifers. More specifically, in the shallow aquifer, better characterized due to the larger number of samples, the δ15NNO3 values of the Cuneo Plain samples vary between 4.00 ‰ and 15.61‰; the δ18O values vary between 4.2‰ and 10.0‰. In the Poirino Plateau, the δ15N NO3 values cover a broad spectrum, ranging between 7.55‰ and 20.66 ‰. The δ18O values vary between 10.0‰ and 13.6‰. Finally, in the Turin Plain, the δ15NNO3 values vary between 5.47‰ and 13.81‰ and the δ18O values between 4.5‰ and 14.9‰. In order to define the main sources of nitrate in groundwater, isotope data of nitrate were plotted in Fig. 6. The correlation diagram shows that nitrate contamination in the Turin-Cuneo plain originates from: synthetic fertilizers (defined as A in Fig. 6); mixtures of synthetic and organic sources, slightly denitrified (B in Fig. 6); manure or septic tank effluents (C in Fig. 6); soil organic matter (D in Fig. 6). However, regarding the samples defined as D in Fig. 6, they show nitrate levels higher than 35 mg/L, and consequently it is more probable to hypothesize their source as a mixture of synthetic and organic sources. Two samples have nitrate deriving from synthetic fertilizers (A in Fig. 6) and belong respectively to the shallow and deep aquifer. The δ15NNO3 of both of them is higher than +6‰, while generally the δ15NNO3 of synthetic fertilizers is inferior than +4‰ (Clark and Fritz 1997). In general, a total range of −8 to +7‰ was observed by different Authors (Hübner 1986; Macko and Ostrom 1994; Vitoria et al. 2004). These high values can be attributed to nitrate fertilizers that often have slightly higher δ15NNO3 values than NH4+ fertilizers (Kendall et al. 2007). Both in shallow and in deep aquifer nitrate derives in most of samples from mixtures of synthetic and organic sources, probably with a light degree of denitrification (B in Fig. 6). Sacchi et al. (2013) hypothesized that the same isotopic composition, in water sampled in the central Po Plain, could also derive from mixed sources in disequilibrium with δ18OH2O. While nitrate from mixed sources (B and D in Fig. 6) mainly belongs to Cuneo and Turin plains, nitrate deriving from manure or sewage (C in Fig. 6) was only sampled in Cuneo plain. In addition to nitrate sources identification, the correlation analysis δ15NNO3 vs δ18ONO3 was also used to evaluate the denitrification and nitrification processes. Aravena and Robertson (1998) demonstrated a concomitant enrichment in δ15NNO3 and δ18ONO3 during denitrification. In addition, nitrification produces a positive correlation between the nitrate concentrations and δ 15N NO3 (Choi et al. 2003), due to isotopic fractionation. Indeed, since 14N reacts faster than 15N during nitrification, incomplete nitrification results in 15N-depleted nitrate (Mariotti et al. 1981). Therefore, preferential inflows into groundwater of nitrate produced through incomplete nitrification result in low nitrate concentrations and δ15NNO3. With the proceeding of nitrification to completion, the concentration of nitrate and δ15NNO3 increase gradually. The slope of regression line would be different depending on the initial δ15NNO3 of original source-N (Choi et al. 2003). A significant denitrification, highlighted by a progressive enrichment in δ15NNO3 and δ18ONO3, was distinguished in the shallow aquifer, especially in the Poirino Plateau (E in Fig. 6a). This result was also highlighted in previous studies analyzing denitrification in the Turin-Cuneo plain (Lasagna et al. 2005, 2016b; Debernardi et al. 2008). The presence of deposits with low permeability in the Poirino Plateau, indeed, can enhance denitrification, as also reported in Sànchez-Pérez et al. (2003); moreover this aquifer has a low oxygenation, also highlighted by high iron and manganese concentrations (Debernardi et al. 2005). The groundwater samples from the Turin and Cuneo plains generally show a slight denitrification (B in Fig. 6a) or do not show an isotopic trend correlated to a denitrification process. Furthermore, the positive correlation, especially in the shallow aquifer, between the nitrate concentrations and δ15NNO3 in Turin and Cuneo plains (Fig. 6) supports the presence of a nitrification process in aquifer. This behavior is evident in shallow aquifer for the sampling points of Turin and Cuneo plains (Fig. 7) and it is consistent with the results of diagram of Fig. 6, in which one sample shows an isotopic composition corresponding to synthetic sources, partially nitrified (A in Fig. 6a). A nitrification process is not evident for Poirino Plateau analyzing nitrate vs δ15NNO3 correlation (Fig. 7), due to the scarcity of sampling points. Boron isotopes were used, associated with δ15NNO3, to discriminate further among the main anthropogenic sources of pollution, because fertilizers, manure and wastewater may have characteristic isotopic compositions. The boron concentration, analyzed in 34 shallow aquifer and 8 deep aquifers samples, is generally inferior than 15 μg/L (detection limit), with the exception of four samples of shallow aquifer in which the concentration ranges between 20.2 and 86.1 μg/L. Two samples belong to Poirino Plateau and the other two to the Turin Plain. These samples were also analyzed for δ11B, showing an isotopic composition from 8.37‰ to 18.05‰ (Table 1). These compositions are consistent with the most frequent range for boron in Italian groundwater, that is comprised between − 10‰ and +25‰ (Pennisi et al. 2013). The boron concentrations do not correlate with nitrate levels; moreover, the sampling points with the highest nitrate concentrations always show boron content inferior than detection limits. The δ11B were then plotted with δ15NNO3 in the diagram of Fig. 8. The δ11B values, used for compositional fields, are derived from previous studies (Komor 1997; Widory et al. 2004, 2005; Tirez et al. 2010; Pennisi et al. 2013). More specifically, low δ11B values (about from − 6‰ to + 13‰) are generally related to contamination from sewage and/or synthetic fertilizers, whereas manure (cattle, hog, poultry) has an isotopic signature more positive (about from + 7‰ to + 42‰). According to the obtained results (Table 1), the hypothesized mixed origin of nitrates (sewage and manure) was confirmed. More specifically in Poirino Plateau, nitrate is related to hog and poultry manure. Samples 014 and 017 have nitrate levels equal to 27 and 29 mg/L and δ11B equal to 18.05‰ and 16.77‰ respectively; they were both sampled in agricultural wells with a depth inferior than 20 m. In the Turin plain, the sample 42 was obtained from a 20-m deep monitoring well, located in a rural area. The nitrate concentration is relatively high (41.1 mg/L) and δ11B is 12.99‰. According to Fig. 8, the source of nitrate is cattle manure. The point 41 was also collected in a monitoring well, 42.2 m deep, located in the center of Turin city. The nitrate concentration is 35.8 mg/L and δ11B is 8.37‰. The δ15NNO3 versus δ11B correlation highlights an origin related to sewage. This confirms the presence of leaking sewage networks under big cities. The origin of the highest nitrate concentrations was not defined using this method because of the low concentration on B in groundwater. The results of this study are consistent with studies made in similar contexts, e.g., Sacchi et al. (2013) conducted a B isotopic investigation in highly impacted areas of the alpine foothills of Lombardy (NW Italy). 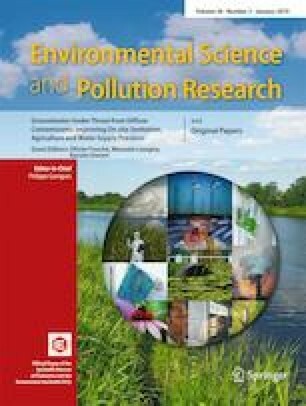 In their study, boron concentrations ranged from 20 to 540 μg l−1 and δ 11B values from − 1.4‰ to + 26.2‰ and these results, correlated with isotopic signature of nitrate, confirmed that both sewage and animal manure could contribute to nitrate pollution in the investigated area. However, contrarily to our study, contamination from sewage was observed in areas mainly devoted to agriculture whereas samples from suburban Milan, where sewage was considered the most likely source of contamination, show a δ11B typical for cattle manure. The authors suggest that nitrate in Milan area can be related to contamination that occurred in the past, when the area was still mostly devoted to agriculture. The use of stable isotope of nitrate and boron can be a very useful tool in the investigation of diffuse contamination. Many nitrate sources can introduce nitrate in groundwater system, and among them sewage, animal manure, chemical fertilizer and natural soil mineralization. To discriminate between them is not simple but extremely useful, especially to implement management actions for groundwater protection. The study focused on the shallow aquifer of Turin-Cuneo plain. It shows high nitrate levels, having 50% of monitored points nitrate concentration between 25 and 50 mg/L, and 24% superior than 50 mg/L, up to 177 mg/L. The most polluted areas are located in Poirino Plateau and in Cuneo plain, near Fossano and Racconigi towns. The deep aquifer groundwaters are generally more protected, and all water samples have nitrate level inferior than 50 mg/L. The boron concentration is generally inferior than 15 μg/L, except four samples of shallow aquifer in which the concentration ranges between 20 and 86 μg/L. Stable nitrogen (δ15NNO3) and oxygen (δ18ONO3) isotope data of nitrates were used to define the main sources of nitrates in groundwater. The isotopes investigation indicates that nitrate contamination in the study area originates from different sources, more specifically from mixtures of synthetic and organic sources, and manure and/or septic tank effluents. In effect, the mere use of nitrate stable isotopes is unable to discriminate between manure and sewage effluents. The integrated use of δ15NNO3-δ18ONO3 and boron isotope δ11B, instead, can contribute to discriminate further among sewage/septic plumes and cattle, poultry and hog manure sources, because of their different isotopic composition. However, the presence of very low concentration of boron in shallow groundwater permitted to evaluate δ11B only in four water sample, 2 located in Turin plain and 2 in Poirino Plateau, the most contaminated area. The analyses confirm that both the sources are present, precisely hog and poultry manure in Poirino Plateau, cattle manure in Turin plain and sewage under Turin city. This supports the presence of leaking sewage networks under big cities. The stable isotopes of nitrate were also used to understand the nitrate dynamics in groundwater. The main results are the evaluation of a nitrification process and a subsequent phenomenon of denitrification in aquifer. The identification of denitrification process is very important in hydrogeological studies, because denitrification decreases the nitrate concentrations in groundwater and, therefore, plays a fundamental role in nitrate attenuation. Particularly a significant denitrification process was highlighted in the shallow aquifer of Poirino Plateau that on the other hand is also the most contaminated part of the study area. Moreover, contrary to expectations, a strong denitrification process was not assessed in the deep aquifer. This study indicates the presence of many source of nitrate contamination, highlighting a significant contribution provided by synthetic fertilizers and manure. High nitrate concentration were observed also in NVZs (Nitrate Vulnerable Zones, according to Nitrate Directive), where the use of manure was significantly restricted (170 kg N ha−1 year−1) according to Nitrate Directive. Currently the limit is 250 kg N ha−1 year−1 after European Commission derogations (European Commission 2011, 2016). The only monitoring point located under a big city, in this case study Turin, underline the possibility of nitrate pollution due to losses from sewage networks. Management plans and remedial actions should consider both agricultural and urban underground infrastructures in order to mitigate the nitrate pollution. To focus more deeply and comprehensively the problem, future research should focus also on pathogens and emerging contaminants (caffeine, sweeteners, antibiotics…) characterized by a widespread presence in the human diet or habits, to use as environmental tracer. The results of these studies could provide new data to identify sources and pathways of contamination and consequently give useful indications to assist the stakeholders.